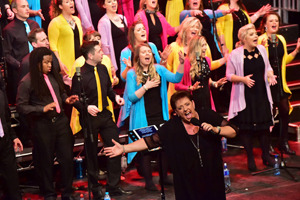 The Belfast Community Gospel Choir travels the world to perform its brand of high-energy, inspirational gospel music. The group will perform at Lakeview Middle School in Warsaw at 7 p.m. April 19. Marie Lacey is a lifelong resident of Northern Ireland, a troubled nation for decades. When hostilities finally ended, she prayed about what she could do to help bring a sense of unity to her nation. From there, the Belfast Community Gospel Choir was formed. The group will perform a free concert at 7 p.m. April 19 at Lakeview Middle School, 848 E. Smith St., Warsaw. Lacey remains the director of the choir a decade after it was formed. She said she wasn’t the only one who wanted that sense of unity that should come with peace. And when she began looking, she found people who were ready, willing and able to sing. She said the choir began with 67 auditioned voices. Because of its high profile and success, more singers have joined. “At the moment we are at maximum membership with a large waiting list,” she said. BCGC brings a strong sense of community and accountability, but from a sense of family that audiences pick up on and take into their own lives. The group travels extensively, including a performance during services at Warsaw’s New Life Christian Church and World Outreach. “We have had numerous highs – such as performing for royalty and foreign dignitaries and our oversees travels. In 2014 we performed in New York and the following year in Boston,” said Lacey. “In 2018 a group from the choir performed in Warsaw, Indiana, and it was an amazing time. We received such fantastic hospitality and warmth from our audiences that, when invited back, we accepted in a heartbeat. “The past years have, however, brought several lows when we suffered the passing of three of our members through cancer. It was with great sorrow that we sang at all three funerals. Lacey said one particular compliment lives at the forefront of her mind. “After one of our concerts a gentleman made his way to speak to me. It was his first time to hear the choir and he said it had ‘changed his life.’ He was 84 years old! For more information on the choir, visit bcgc.biz.